2. We will need EACH OTHER when we finally select a nominee. Granted, it would be much easier if you all would just let me choose a candidate for you - but it seems this whole "thinking for yourself" deal seems to have caught on. Unless you're Bob Beckle. Can we all agree that at the core we want two things? 2. we want someone who will MANAGE well? And by "managing well" I mean, limit government, create an environment for the economy to rebound / create jobs, and to transform us back into a Constitutional government - whatever that may mean to you. If you don't agree with these goals then.... GET THE HELL OFF OF MY BLOG!!! …(Sorry, I was told this week on Twitter I might alienate some liberals with my recent language and uncivil tone, so let me restate this in a kinder, gentler, more erudite manner....please get the hell off of my blog. And grow a brain...Please.) See! I didn't use BOLD, ALL CAPS or RED! Civility! (14 months before an election) on Perry’s superior “electability” by polling. Unfortunately, this week we found out two things. Romney has cut the Perry lead from12.5 to 5.3. And the supposedly ‘unelectable’ Palin actually performs 4 points better against Obama than Perry. I won’t rehash all the Obama, McCain and Clinton polls underlining this point. (You’re welcome). And how about the dreaded ‘negatives’ of a canddiate? A January poll found Palin’s negatives within the GOP 8 TIMES GREATER than the most likeable candidate! Horrific, right? Not quite. She had an 8% “strongly disfavor” against Huckabee (1%) the most likeable. Hardly a disqualifier. Per PollInsider, Hillary has swung from +30 to –9 back to +25 and back. Time and chance happen to all. Conclusion: Polls don’t mean squat. Communication/Education – In my humble opinion, there are only 2½ GOP politicians that reflect what I believe was Reagan’s greatest ‘secret’ strength. I say ½ because Christie, unlike Rubio and Ryan, is woefully deceptive on many conservative positions. Reagan could EDUCATE while communicating his position that everyone could understand. I have no idea the number of neighbors who have called the police over my TV set screaming at the GOP candidates who kept giving generalized answers in the debates. I remember Bachmann, Perry and Romney specifically saying either Social Security is insolvent or needs to be reformed – but not adding a simple explanation underlying HOW they came to this conclusion. A simple, “Social Security counted on 140 people paying for 1 senior when it started but now it’s down to 3:1” would have not only given policy gravitas to whomever used it, the TV audience (and MSM no doubt) would have been educated on fact over emotion. Newt is the ONLY guy we have who consistently has shown this talent. Reagan overcame the “Voodoo Economics” charge of GHW Bush ONLY because of this. And the MSM that would amplify these inner-GOP volleys find less lifespan because the data is now ‘out there’. I was certain Palin had this ability in 2008 but sorely missed it over the past couple of years. However, her last two speeches have been much better. People respond to truth. It resonates. 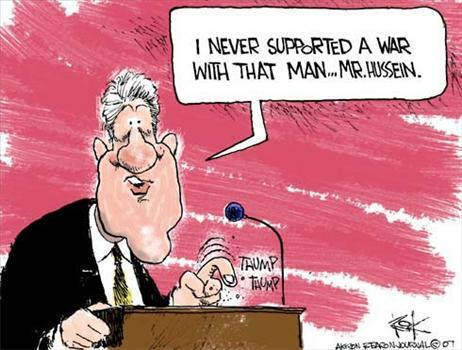 Bill Clinton was exceptionally gifted because despite what you might think of his moral and political positions, he was smart, knew policy, and could explain his position not just emotionally, but on what he felt were the underlying ‘facts’ to support his position. Conclusion: The candidate that doesn’t just state their policy - what is ‘right’ or ‘wrong - but explains it from BOTH an emotional and logical viewpoint will win independents who really don’t tune in to any of this stuff until November 1st. The Debate/Wit Corollary: A subset of this is the “there you go again,” ability is not just in quips and wit. But also to quickly get to the CORE of what the issue/attack/question is about. Again, Newt gets 5 stars on this but I have yet to see ANY of our candidates show BOTH wit and intellectual depth needed to woo opponents and undecideds in a likeable way. Money – Obama could have $2 Billion for his campaign and I doubt it would help him any more than the $1 Billion he is rumored to have. Money alone doesn’t win elections (Linda McMahon for CT Senator as an example) but as Tim Pawlenty learned, you can’t survive without it. Experts agree Palin and Giuliani would have no problem raising funds if they entered, but of the current slate it seems only Perry, Romney and Bachmann are positioned well. My friends who have donated to Bachmann get calls about 80 times a week. The woman knows how to raise money. Cain and Gingrich aren’t far behind. It is important to remember, Obama had almost NO dinero when he started his Presidential campaign while Hillary was the Queen of “Kwan.” But money poured in as his performances (and primary victories) rolled in. They also did,to a lesser extent, for John McCain. Don’t forget, at one point McCain was flying coach in 2008. Conclusion: They don’t have to HAVE the money, but they do have to have the ability to raise it. Campaign Organization – A great anecdote about Michelle Bachmann was shared on FOX News Sunday at the Iowa straw poll. At one point in the day, quite a few people had gathered at the Bachmann location when she shouted out, “Who here hasn’t voted?” Dozens raised their hand. Michele didn’t just tell them to vote, she made everyone with their hand raised follow her to the voting location. She won by only 152 votes. Having ‘boots on the ground’ is the key of democrat voting ‘machines.’ Whether it is door to door politicking or driving the seniors to the polling place election day it can make a huge difference in a close race. In the primary election these also can be enormously valuable. Rumors of Obama’s fraud against Hillary is well known (and documented in We Will Not Be Silenced) and although sinister, shows what can be done with ground troops. My friends at True The Vote uncover thousands of cases of fraud in EACH state they work. Unless the popular vote is a landslide, the GOP candidate that has well organized volunteers could be the difference in a close election. Background: One of the biggest arguments never heard in the 2008 election was that Barack Obama had never run anything. The answer from the MSM and his supporters was He ran a $750 Million+ campaign. Now we see he hasn’t even continued to run a good campaign in place of a Presidency! Certainly being a Senator (even a first term one) didn’t hurt him. I keep hearing Ann Coulter and others dismiss Bachmann because a sitting House member hasn’t been elected to the Presidency since 1880. This irritates me as much as when I hear how a Big 10 school hasn’t beaten an SEC football team in a bowl game for 400 years… or whatever. Whether a Yankees team (boo) has beaten a Cubs team (yeah) in the past 100 years has NOTHING to do with the individuals and coach on THIS YEAR’s team. If it did, the Florida Marlins and Anaheim Angel players would have been tripping over the ghosts of Lou Gehrig and Willie Mays never making it to game 5. And for non-governmental types, we just don’t have many examples of Ross Perots with NO government experience running. But there will always be a lot of people who are still under the impression – real or imagined – that not knowing how “government works” would be too risky. I personally LIKE former or current Governors because the “process of managing” is completely different from LEGISLATING. As we learned from Suskind’s book this week – Obama really doesn’t have a clue on how to manage. But I can’t see where background is going to override personality, communication or ‘aura’ in a general election unless the ‘perception’ of management/leadership is an issue with the candidate. A Candidate must win the GOP Primary before even THINKING of winning the general election. This sounds obvious but is an overlooked issue. Those saying Christie or Giuliani should run because they are more electable many not comprehend that HALF OF GOP Primary voters are evangelical Christians and even more are socially conservative. And even if the argument that a blue state politician was more electable – you don’t know social conservatives well if you believe they will vote against principle. Therefore, unless multiple evangelically-accepted candidates split that vote, a non-social conservative is screwed. Or conversely, if Giuliani and Christie both jump in, the stronger of the social conservatives might prevail. The key is NO ONE knows what the mix of candidates will be between now and the first few primaries. Finding a supposedly more “electable” candidate can’t and won’t work. It never has. Now the quandary that many seem to have with this GET ELECTED and GREAT MANAGER duality is that some seem to think they are somewhat at odds with each other. Common wisdom says that if we get someone who is "electable" they may not really want to shut down the Departments of Energy and Education and the EPA - restructure entitlements - get serious about the border and illegal immigration - stop the public funding of abortion - etc, etc, etc. I could be wrong, but can anyone see Romney, Huntsman or Gingrich aggressively executing conservative principles like this? Conversely, no one doubts Ron Paul would do many of these things but many of us would worry he would not try to bring the American people with him and would go too far on other issues like legalizing pot. A candidate NOT saying what they plan to do (which some have advocated) is no good either. That is essentially Barack Obama who didn't trust the American people to understand what "CHANGE" meant. Why? Because he never would have gotten elected of course! As Rush Limblahblah says, "Liberals have to lie to get elected." He's right. The other serious issue brought up is that THE BASE OF BOTH PARTIES is more "extreme" than the independents we are trying to attract. Or so we are told. Karl Rove believes no one can elected by being truthful about Social Security being a Ponzi Scheme. (Ponzi turns out to be an educated opinion it turns out.) But Bob Turner of recent New York District 9 success, actively discussed the frailness not only of Social Security but of Medicare (and was carpet bombed by the opposition as what they felt would be a 'winning' issue) to great advantage. He threw in conservative positions on Israel and Gay Marriage to boot! I don't feel we should be afraid of this. Reagan was staunchly pro-life in an era where this was a top national issue and 60% of the population was pro-choice. Why would we hesitate to bury this when as recently as 2009 when support fell down to 47%. Abortion was a top deciding factor in elections in 1980 but is only a deciding factor for about 15% of voters in the last few elections. The difference is he didn’t make it scary to the majority. And there is some evidence that focusing on this divisive issue HELPED Reagan. A great article by Bill Spadea makes an argument that “polarizing” candidates have success going back to Abraham Lincoln. Anyone who has read JOHN ADAMS, realizes dissension against popular opinion goes back to the founding of the country. And as many have stated, we got the “non-polarizing” candidate that independents would love in 2008. The man wouldn’t even frown at Obama in a debate, much less ask him if he wouldn’t mind going through the same scrutiny he (McCain) did regarding his eligibility. Which brings us to the issue of POLICY and MANAGING, to be covered in Part 2 this week. In that part I will ‘grade’ the candidates as I see them in BOTH ELECTABILITY, POLICY and MANAGING. Because we all know “it's about the economy stupid,” right? I LOVE YOUR DRY WIT. You have missed your calling. You should be managing someones media message. And of course your are right. 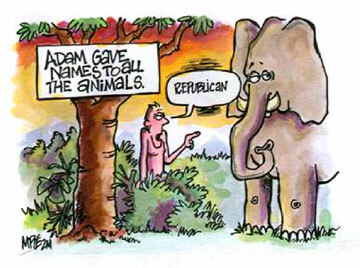 1st of all, its difficult to parse thru the names U got on that elephant. Im just trying to eat what's actually on the real menu. I'll try to deal w/the hypothesis (Palin, Bolton & Marco) later on, because they ain't on the menu. On electability, for the moment, there are only 3 in my opinion - Perry, Mitt & Paul. Cain is nudging 4th in that area. He's the 1 to watch. I look at polls sometimes. But also feel the pulse from talking 2 folks in real life & watching discussions on blogs & twitter. Its an exhausting task for a political junkie. And I follow past trends. Electability initially starts off as a PERCEPTION game, even if the perception is false. But the candidate has to be likeable. Obama was more likeable than Hillary, eventhough she was more experienced. She was perceived as "cold". Folks liked Obama so much (for various reasons) that they waived his LACK of experience & came up w/excuse to penalize Hillary for having too much of it. Fastward to present: Perry is perceived as the "tell-it-like-it-is" "no bull" big tall Texan w/jobs in oil booming multi industry large state & has that southern gentleman cowboy charm. Mitt - the nerdy mormon whose tired of losing; his verbage is too anxiously fast like Gulliani. He's the kind of guy a girl would say "NO" to, unless he had the money. Paul - though perceived as fringe by most, but is likeable mostly to a big energetic audience of younger folks who are rabid enough to batter-ram to get him elected; Cain - the likeable jolly grass-rootish fellow; & if he just had enough money he can make 4th place. Despite all this electability talk, folks this time around are gonna want JOBS. If Obama was up against Mitt in 2007, & if the economy was bad as it is now, who do YOU think would had won? Nerdy Mitt or Smooth Talking Obama? I'd say Mitt, because he was the only 1 in the 2007 line up that was perceived to had business-related experience. Regarding money ... well remember Mitt Romney who had the most money but just couldn't seem to make it. Forget about McNasty McCain who was so broke that he had to catch the bus to campaign stops. Even a stone broke southern baptist guitar playing preacher beat out Mitt. Now what does that tell yah? I guess in Mitt's case, the message is: "Money cant buy everything".